A slow cooker is godsend to any busy family’s food preparation plans. You can cook an entire meal while you doing other things during the day. This is perfect for when you have to work or chores to do, but you have desire for a nice home-cooked meal. When it comes to home-cooked meals, nothing is better than a big plate of comfort food and a slow cooker is a perfect tool to prepare it with little effort and less clean up. Here are some of the top comfort foods you can cook in your slow cooker. Pot Roast. Everyone loves a delicious pot roast, but not everyone loves the hassle involved with preparing one. Don’t worry, you don’t need to turn on a hot stove and make your kitchen a sauna by having the oven on all day. You can easily let the roast cook in the slow cooker. By the time dinner rolls around, your roast is will be tender and practically falling apart. For best results, use a chuck roast and add in some potatoes, carrots, beef or vegetable stock, water, seasonings, garlic powder, and onion powder. Let it cook all day on low or for a few hours on high. Chili. Chili is a hearty meal that make you feel warm and toasty when the weather turns cold. Try a vegetarian chili by substituting extra beans for meat, or go lean with some turkey. Of course their is the standard ground beef chili which is cooked with vegetable bouillon, water, tomato sauce, and diced tomatoes. Add in some chili beans and pinto beans, along with chili powder, onion, garlic, cumin, salt and pepper. For a spicier chili, add in cayenne and diced chili peppers. Chili is one of those dishes that is foolproof! You can find your favorite flavors by sampling and trying different seasonings. Beef and Gravy. This is a perfect dish to serve over a mound of fresh, homemade mashed potatoes. Beef tips and gravy require cubed beef — usually stew meat— with sour cream, cream of mushroom soup, and beef broth. If you like mushrooms, make sure to add in sliced mushrooms or canned mushrooms, along with a packet of dry onion soup mix along with any other seasonings you like. Cook on low for about 6 to 7 hours and serve. Broccoli and Cheese Soup. I didn’t realize just how easy this was to make, but it’s so much better in the slow cooker then enjoying it at a restaurant! All you need to do is place two package of frozen chopped broccoli, a can of cream of celery soup, a can of cream of mushroom soup, a cup of shredded cheese, and two cans of milk in a slow cooker. Cook it low and slow for about three to four hours before enjoying! Beef Stroganoff. Similar to the previous beef and gravy meal, this is another beef recipe made with stew meat. Just add cream of mushroom soup, cream cheese, milk, garlic, salt and pepper, and Worcestershire sauce. After the meat has cooked about halfway through, add egg noodles and vegetables like peas and carrots. These are just a few ideas to get you started on making easy and delicious meals in your slow cooker that you and your family can enjoy and not have to worry about complicated preparations and clean ups. Dinner is served! Broccoli and cheese soup is a huge favorite in our house. We have a couple of ways we make it as well but, yes, easy to make! We had broccoli and cheese soup for Christmas Eve last year. It is so easy to make in the crockpot. I make chili all the time and I love it. I need to make a Pot Roast and the beef stroganoff sounds delicious. I also make a lot of pulled pork and bbq in mine. Great picks. I cook with my slow cooker all the time, and these are all go-to’s for me. Pot roast is always on my play list for the crock pot. You really can’t go wrong with that one. It is slow cooker time here. My favorite is the broccoli soup. I love using my slow cooker! Homemade meals without all the fuss and the clean up is a dream. I must try that broccoli and cheese soup! Being on the crockpot comfort foods now that the colder weather is here! Slow cooker recipes are what’s on the menu! I need to use my slow cooker more instead of ordering take out all the time. It’s hard to cook at home with such a crazy schedule! The sound of all of these makes me hungry! I love this time of year especially for crock pot meals, even though I do use mine regularly. I have been on a huge slow cooker kick lately, maybe because of the cooler weather. Pulled pork is my comfort food recipe to make these days! This is my favorite time of year for the slow cooker. Broccoli and Cheese Soup, yum! I’m thinking of making it this weekend. I love how slow cookers make your house smell all wonderful and make it easy when you get home at night when you are tired. Win Win. Buying in bulk and using the slow cooker are two of the best ways to have a healthy, hot meal no matter what the weather is like outside. Everything sounds so yummy. I have to try making broccoli soup at home. I haven’t cooked as much in my crockpot as I’d like to! Only because I work almost an hour from home, so I’m away from home about 10 – 11 hours. But, I love to cook Chili and Broccoli and Cheese soup 🙂 Wonderful comfort foods! I love my crock pot, it makes dinner time so much easier when I don’t have time to cook. 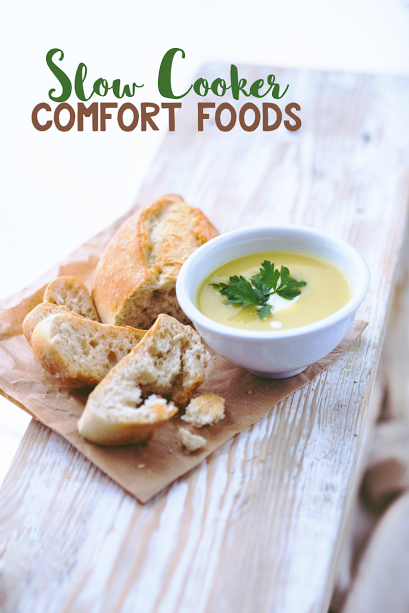 I love all these “comfort” foods! I love making chili in the crockpot. I make a big batch at once and then I eat on it for a long time. I’ve been meaning to get a slow cooker for awhile, these recipes sound divine! Gosh I’m so with you on this! I love stocking up on cream of stuff and broth this time of year just so I can slow cook some comfort! I also just love the ideas others have with using a slow cooker in a way I never thought to. All of the above ideas are part of our crockpot/slow cooker recipes. I would head right to the store and get another one if it broke down. Chili is an all-time favorite for ever member of the family. I love slow cooker pot roast. Our new favorite is slow cooker chicken and dumplings though. Yum, these are amazing ideas. I think some-spicy chili would be perfect to warm up with right now. A good Beef Stroganoff could be really comforting too. There’s nothing better than good healthy comfort food on a cold day or when you just need a pick-me-up! At least in my opinion. These are all some great ideas that I’m going to have to try soon. I have yet to try that Broccoli and Cheese soup. We rarely do some slow cooker foods here but indeed these are really comforting. Perfect for the coming season. Pot roast and chili are two of my favorites. I love how the scents fill the house all day. Your soup looks so yummy. I love my slow cooker. Tonight it was pork chops in it. I need to make these! I love using my slow cooker. I love slow cooking recipes! I would definitely be interested in the Broccoli and cheese! Oh yum, a beef stroganoff would be amazing in a slow cooker, I must say! That’s something to jot down for dinner! I’ve pulled my slow cooker out! I love it during the Winter. It makes my life so much easier and there is a warm meal out. Slow cooker recipe is what I love! I’m about slow cooker this month. My husband travels for a living and I’ve been relying heavily on my slow cooker. It helps so much! I love your list too! This one is fantastic! I’m craving for this one. When it comes to the winter months, I am all about using my slow cooker for meals like this! I tend to use my slow cooker for soup. My fall and winter fave is butternut squash soup, but I’m a huge fan of broccoli cheese. Will have to try it out next time. These are some of my favorite foods! I’ve been craving comfort foods lately and I’m sure it’s due to the changing seasons. Broccoli Cheese soup sounds especially delicious right about now. All of the above was love!! <3 It made me crave . These are all great comfort foods to make in a slow cooker. I would love to make the broccoli and cheese soup along with the chili in the slow cooker. It is the perfect time of year for making chili and soups. Thanks for sharing the recipes. I love this list! All these are my favorite! Pot roast, chili and broccoli and cheese soup are staple dinners in our house. These are great ideas. I love comfort foods when the weather starts to get colder. This is a nice assortment of dishes for the slow cooker. We are big fans of using the slow cooker in our household! I love my slowcooker! I love your suggested dishes to try, I have only used a handful of those! Great way to set it & forget it till dinner time! I would rather spend my time with my girls and less time in the kitchen. These are some of my favorite recipes. I love using my slow cooker to make delicious recipes without all the work. Beef Stroganoff is one of our favorite crock pot meals ever. We eat it at least a few times a month. Yum! The last time I made Broccoli and Cheese soup in my slow cooker my whole entire family was over the moon. I need to make some more! This is a great list, I need to use my slow cooker more! I so need to get my slow cooker out now that the colder months are here. These are great ideas! My slow cooker is my favorite appliance in my kitchen. This list is perfect. I love to use my slow cooker. I am always looking for new recipes to try. Thanks for the great list. White bean chicken chili is a staple at our house. It’s one of my favs to cook on Sunday, then nibble on throughout the week. We’ve given up red meat, but I love idea of using the slow cooker to make vegetarian or turkey chilli. I’ve used it a couple of times to make soups and it was so convenient. ooo can’t beat some good comfort food! I love that you can do these in the slow cooker because when you are in need of comfort food you don’t want to be messing about and making something fancy! Oh yeah, you’ve got all the family favorites there. My kids love a good stroganoff best! Love this list. Gotta love slow cooker meals. I would love to try beef stroganoff in the slow cooker! Slow cooker meals are the best! My family and I enjoy a nice Sunday pot roast just put it on in the morning and enjoy it for dinner! Can’t imagine life without a slow cooker in my kitchen. One of my personal favorites is a creamy noodle and chicken dish. Thanks for sharing these. I love chili, but broccoli and cheese is sounding so good right now! Wow, I love slow cooker foods. It brings out the best taste and flavor, love these comfort foods! I haven’t used my slow cooker in a while because I have been using my pressure cooker more. Although I do love a good roast in the slow cooker! I want to try the Beef Stroganoff! These slow cooker comfort foods of yours sound so delicious! I love pot roast for sunday dinner! I have never made beef stroganoff though, I think I might have to try that one! Beef Stroganoff is definitely one of my favorites when it comes to comfort foods. All of these are great ideas! that broccoli and cheese is indeed my fave! Love slow cooker recipes, they’re so easy and all you need is to throw the ingredients in one pot! I really appreciate this list of dishes! I absolutely love my slow cooker! It is so fantastic to be able to whip up my favorite comfort foods in the crockpot! Yum! I love using our slow cooker for Italian sausage! I use slow cooker all the time because most of the Indian dishes cannot be made without slow cooker. I can’t even pick a favorite from this list. Everything sounds so good right now. November is so perfect for comfort foods! My mom loves using her slow cooker for almost anything. haha I still want to try Chili! we dont have that here but I’ve always heard about it on shows. There’s nothing like indulging in your favorite comfort food this coming winter. I love the list of dishes here, especially the Chili! It is still fairly warm up here these days, but I think the first really chill day I will be cooking up some chili in my slow cooker! There’s nothing like it to warm you up. Love to try this comfort foods.. Looks so delicious and tasty.. I will add this on my list.